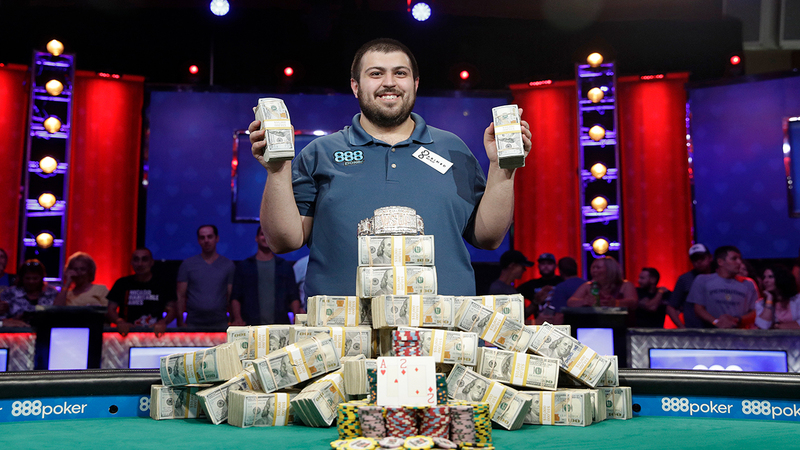 LAS VEGAS -- A New Jersey man with a degree in accounting is this year's World Series of Poker champion. "I'm really happy about how I played tonight," said Blumstein, who's 25. "... This is just one poker tournament. It takes variance and luck and playing your best, and all those things came together, and I'm happy to be the winner." "I'm really happy with the result, really happy with the deuce because I was playing good, but I'm pretty tired of poker at this point honestly, and to have to go back and battle pretty deep again, I wasn't looking forward to it," said Blumstein, who fell to his knees near his supporters after the two of hearts was revealed. Ott, of Altoona, Pennsylvania, earned $4.7 million. Neither he nor Blumstein, of Brigantine, New Jersey, had previously played at the main event. Both had dozens of supporters who cheered and gasped - depending on the hand - throughout the night. Some in Team Blumstein sported T-shirts that wondered "Is this real" and others that declared "I don't like folding." "At the end the chips didn't go my way," Ott told PokerNews.com after the event. "The cards didn't go my way. But I got second place in the third largest Main Event ever. I can't complain about that." The millions of dollars Blumstein earned probably won't go toward buy-ins at high-roller poker tournaments, though. Blumstein said money is not what motivates him to play, but his payout will allow him to do "whatever" he wants to do whether that is play more poker, go into business or return to school. "The best way to get better at anything is through repetition and practice," he said. "When you play online in New Jersey, it's hard for any live pro to see even close to the amount of hands I've probably seen in the last two years."